My husband says that the only time the kids get along well is when they're in water. He's right! It's Friday again! Did this week go incredibly fast or what??! I can't complain about that. The weather here has been incredible. Superb, even! Although, I just finished a new sun hat for my daughter and today it rains. Oh well! I feel like some 5 Question Friday today! 1. Do you have an iPhone and, if so, how do you get apps and what are your favorites? 2. What is your fondest memory of K-3rd grade? 3. What makes you cringe at the thought of touching? Dead stuff. I don't even like to handle moldy food when I'm cleaning out the fridge! 4. If you could have any celebrity show up on your doorstep who would it be and why? If I hearted her any more, I'd have a heart attack. :) My friend and I even write about her old TV show at Murder She Blogged. Yeah...we're superfans. 5. What would you say is your best physical feature? Have an awesome weekend and thanks for dropping by my blog today! 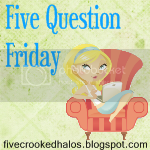 For more Five Question Friday posts, visit Mama M's blog and check it out! "Can I go in, Momma?" "Not yet, take a step back please kiddo!!!" Welcome to another Feel Good Friday, hosted by The Girl Next Door Grows Up! I've chosen to list 5 things that made me really happy this week. No matter how bad or boring you think your week was, I bet you can find 5 things. I sure did...and here they are! 1) A little girl growing up - My daughter turned 11 months old, learned how to stand, and started "cruising" around the house just this week! Wow, changes come fast and furious when babies are learning how to become toddlers. She's very proud of herself and so is her family, too! 2) The joy of cooking - I've never been one to embrace cooking (maybe a little baking here and there) but my husband has happily had dinner duty for many years now. Lately I've turned the corner and learned some chef basics. Surprise, surprise - I love it! Just another creative outlet with instant rewards of "yummm yummm" from the family. 4) A little progress - I traveled to Wisconsin a few days ago for a check-up with my doctor and x-rays showed that my spinal fusion is progressing...maybe not as fast as expected, but bone growth is occurring. I'm excited and very happy that everything is stable and I can start gaining flexibility again in my back. 5) Unexpected perk - One benefit of my trip to Wisconsin was an impromptu dinner with my BFF and her daughters. Oh it was so good to get a little girl-time with one of my favorite friends! Look: I actually got out of the house and did something...with other adults! The expression on the face of the lady in the white tank top is priceless! For more Wordless Wednesday fun, go over to 5 Minutes for Mom today and enjoy! Happy Wednesday! 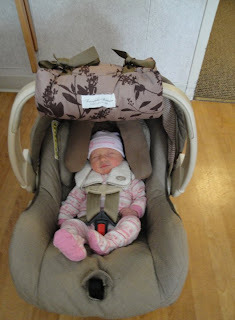 :) I've been feeling pretty stinkin' lucky to be a stay-at-home mom these past six months. Just look at these two cuties pies..
For more Wordless Wednesday fun, please visit 5 Minutes for Mom today! I couldn't wait to put it on this morning! A bracelet with my hubby's name and a clear Swarovski crystal. I love this - toggle clasps are my favorite! I decided that this sweet little charm disc would the perfect addition to a delicate and feminine bracelet. Hopefully we can offer something similar in our shop soon. For now, we're offering a new Many Blessings 3-Disc Initial necklace for the mom (or grandma) of three children. Extra discs are only $3, for those of you with big families. My cousin is expecting baby #3 and I can't wait to gift her a third disc for her Double Dainty Initial necklace. Isn't she sweet? My soft cushions made with cotton designer fabric are designed to cushion mom's arm as she carries baby. And all moms deserve a little comfort, especially after baby arrives! Plus, mom can re-use these as adult seatbelt covers...perfect for keeping that seatbelt strap from digging into your neck and shoulder during car trips.